I mentioned before that, with the notable exception of Kafé Esaias, I was not really interested in any of the cafés on Drottninggatan. There are however a few nice places on the street where I can get a good lunch. This is extremely convenient since my office is right in that neighborhood. My favourite place to get a take-away salad is by far Albert and Jack’s. Built around bulgur, the various salads include salmon, merguez, chevre, tuna or chicken. It comes with excellent bread and nice dressing, for example avocado and yoghurt. 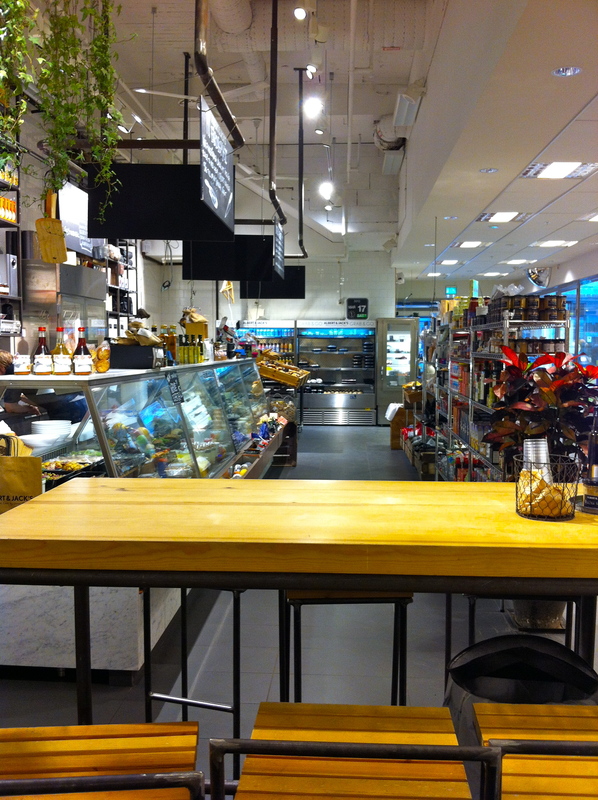 Albert & Jack’s is in fact more a bakery or a deli than a café. 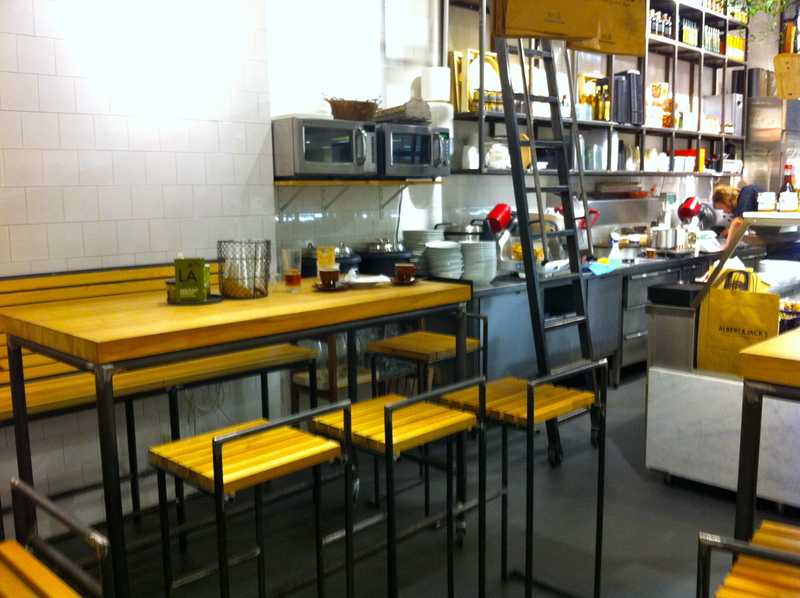 And since it is always packed at lunch time during the week, I never really thought of getting coffee there. That was until this morning. Good friends of mine from Beograd are in town this week. They are staying with my friend AP, yes her again 😉 We met a few times this week (in a bar, at my place and at AP’s for some nice meat pie (pita od mesa) last night. And today we had decided to go to Mariefred. The plan was to leave Stockholm at 11:30. But I have known my friends for quite some time now and I knew very well that there was no way they would be ready on time. I decided to go to the meeting point early anyway and see if I could find a nice café where I could wait for them. It is Saturday, I have been to Mariefred before so I have no problems with leaving a bit later than planned. So, after a quick stop at a book store to buy the Bescherelle equivalent of Swedish verbs, I saw the sign for Albert & Jack’s. After ordering my double espresso in Swedish – and confirming that I would drink it on site also in Swedish – I sat on the corner and enjoyed the quietness of Albert and Jack’s on a Saturday morning. 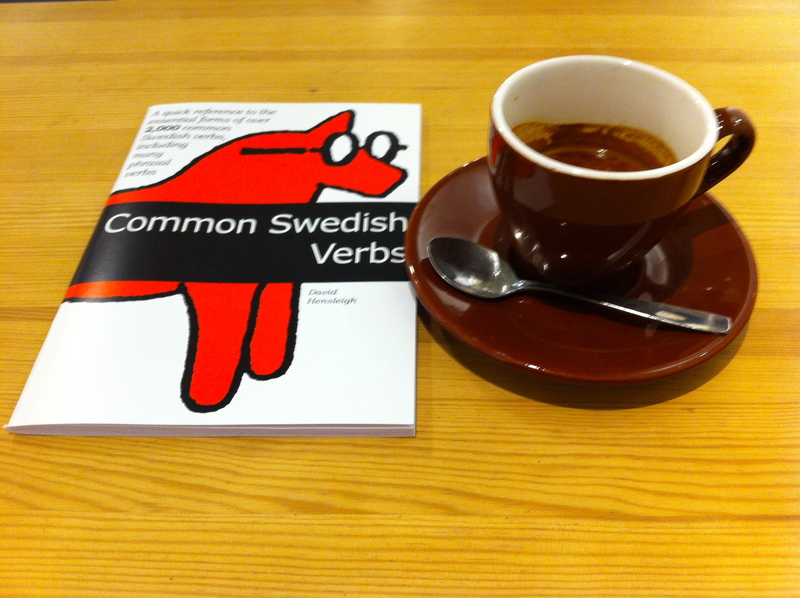 I took out my new Swedish verb-dictionnary for the form but I had no real intention of doing any real work this morning. Everything is so beautiful at Albert and Jack’s that I was quite happy to slowly sip my double espresso while getting lost in my thoughts through the view of all that delicious food, the nice smell of freshly baked bread and – I have to say – the discussion between the staff and the only other customer. I love the food at Albert & Jack’s. And now I can confirm that they also have good coffee. It was perfect for a Saturday morning before a mini-road trip. This is obviously not a café, so one should not expect the same atmosphere as in places like Esaias, Kura or Amsterdam just to name a few. 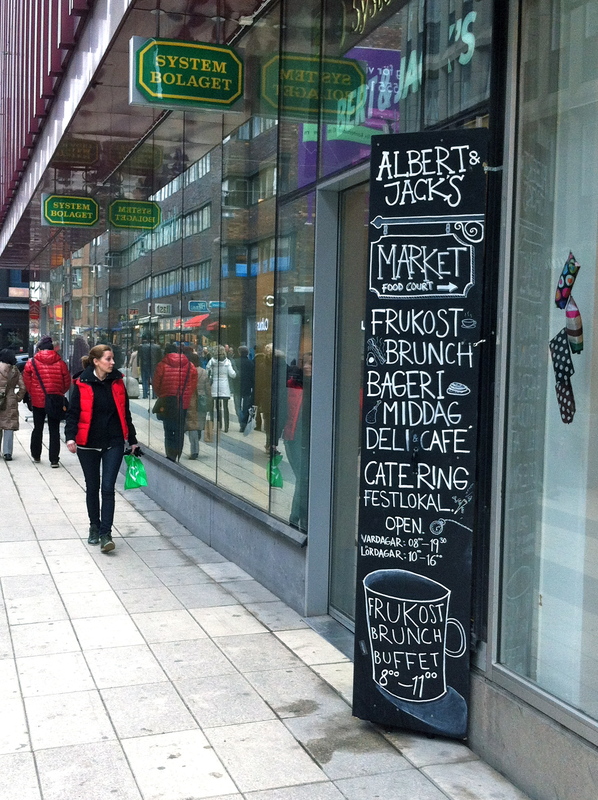 However, Albert & Jack’s makes for an excellent stop for whoever is in need of a nice coffee on Drottninggatan south of T-Centralen. In the end, my friends arrived only 30 minutes after the time we had set the night before. And to be entirely fair, they gave me a heads up 30 minutes earlier than the set time that they would come at 12:00. And we had a great time in Mariefred, despite the cold weather. And I came back with a nice book from Jasper Waldersten’s exhibit at Grafikens Hus. 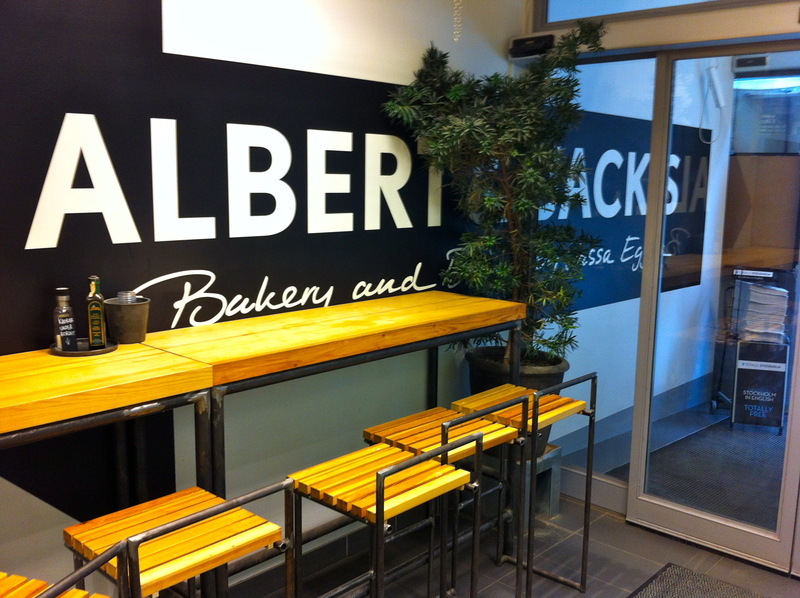 And if you don’t go to Albert and Jack’s for the café experience, I highly recommend that you go for the food. You won’t be disappointed!